Tropical Storm Bonnie made landfall in Florida south of Miami, following a course that would take it across the Gulf of Mexico oil spill, prompting a pause in efforts to clean up the disaster. The National Hurricane Center in Miami said the eye of Bonnie came ashore Friday midday near Cutler Bay, about 20 miles south of Miami. The storm had top sustained winds of 40 miles per hour. There were no immediate reports of damage. The storm has so far has just spread some rain across South Florida. Tropical storm warnings were in place for much of Florida's east coast and from the Florida Panhandle at Destin to Morgan City, La., and includes Lake Pontchartrain, north of New Orleans. Bonnie is expected to strengthen when it moves over the Gulf late Friday and Saturday. The storm is moving west-northwest near 18 mph. Key ships stationed over BP's crippled oil well in the Gulf were ordered to evacuate Thursday as Bonnie approached, but engineers have become so confident in the leaky cap fixed to the well head that they decided it will remain closed in their absence. A broken oil well has spewed somewhere between 94 million and 184 million gallons into the Gulf before a cap could be attached. The crisis - the biggest offshore oil spill in U.S. history - unfolded after the BP-leased Deepwater Horizon rig exploded April 20, killing 11 workers. 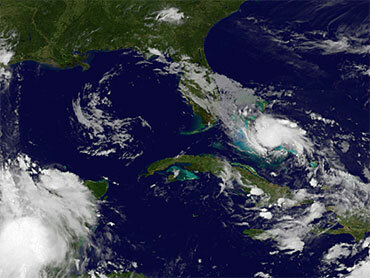 In the Dominican Republic, the storm forced the evacuation of more than 6,500 people and left 26 communities isolated. The director of the Emergency Operations Center said more than four inches of rain fell early Friday. The Department of Corrections transferred nearly 700 inmates to another prison as flooding threatened their prison in the outskirts of Santo Domingo. A couple and their son were injured when their car hydroplaned and crashed into dry reef just feet from the ocean in the Dominican capital. Forecasters said the storm could strengthen a little over the Gulf. The early forecast track would carry it toward Louisiana. Some experts worry the hurricane season could worsen environmental damage from the spill, with powerful winds and large waves pushing oil deeper into estuaries and wetlands and also depositing more of the pungent, sticky mess on beaches. Capt. Stephen Russell, director of the Bahamian National Emergency Management Agency, said there were no reports of major damage, flooding or injuries on islands in the southeastern and central Bahamas already passed by the storm on Thursday. In the Dominican Republic, where roughly 1,500 people were evacuated, rice fields were destroyed and 14 communities left isolated after bridges collapsed. A 14-year-old boy died in Puerto Rico on Sunday after drowning in a swollen river. Haiti's Department of Civil Protection reported minor flooding in the northern Artibonite region but no injuries or major damage.